So a while back I said I was going to doing the 100 Happy Days Challenge. I started this on 2nd March, and on 9th June I finally completed it. 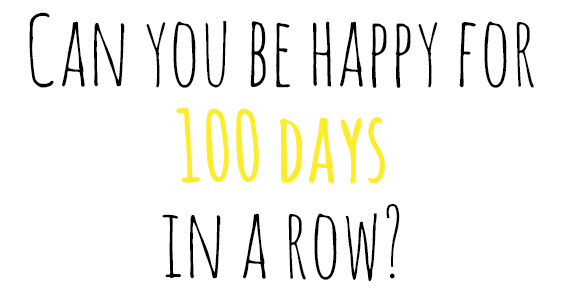 The idea was to take a picture everyday for 100 days of something that makes you happy. As my original post about 100 happy days mentioned, about 71% of people never complete the task. And I can understand why. Life gets in the way, you phone battery is low, you have a really crap day and really struggle to find even the smallest of things that can bring a smile to your face, or you’re just too busy enjoying life to remember to take a photo. This happened to me a fair bit. There were days when I forgot to take a picture, so I cheated and grabbed a relevant picture of what it was that made me happy from the internet, and used that as my daily picture. The thought was still there. I had noticed as to what had made me happy that day and that is what I think is important. The task is meant to make you appreciate the little things in life, help reduce stress, and to give a more positive outlook on things. I guess in the most part it did while I was doing the task. There were days when things were really rubbish (usually work based!) and I thought I would never be able to complete 100 happy days, but could probably quite easily complete 100 grumpy days! I think there’s only so many pictures of work you can take, especially when you’re restricted by data protection a lot!! Before I’d started the task I’d not heard of it at all, but then it seemed to spread like wildfire and loads of people seemed to be doing it, or were half way through, or nearly finished. It was really nice to see daily (or weekly!!) updates of how friends were getting on with their task, and what little things in life were making them happy. I’ve got a friend who has completed her 100 happy days task, and has decided to carry it on, with the hashtag of #lifetimeofhappydays which I think is a great idea. I wish I had the stamina and perseverance to continue with a life time of happy days. But truth be told I’m just too lazy! I have noticed that my stress levels have increased since I’ve stopped doing 100 happy days, but that could be a combination of things – work being rubbish at the moment, a severe lack of holidays/time off work, family illness, etc. I don’t know maybe I’ll start it up again, or try this other new one I’ve seen going around where for 7 days straight you have to list 3 things that have made you happy that day. Now I know that some days I will REALLY struggle to find 3 things that make me happy. I don’t know, we’ll see! So, I had planned on keeping my 100 happy days page up to date mostly, but that didn’t really happen. So the other day I made it my mission to up date it. There are all 100 pictures on there, each one with a little comment about either what it is, or why it’s made me happy. 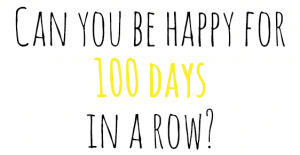 Let me know if you’ve done the 100 happy days challenge. I’d love to see how you all did. Did any of you not complete it? Did you notice any difference in your stress levels and general happiness?